At what point should the coach or trainer implement a training or lifestyle intervention when an athlete is showing warning signs of excess fatigue? This is easy to determine when looking back on the data retrospectively, but in real-time this can be a challenging question to answer. Especially when performance remains relatively stable during the early stages. There’s a sometimes blurry line between being too soft (changing the plan at every red flag) and being too hard (ignoring too many red flags). In observing this athletes trend, it appears that the situation could’ve been easily avoided had some type of intervention been made early enough. The trend for HRV, and perceived measures of sleep quality, fatigue, soreness and stress all indicate that this athlete is heading for trouble. With poor sleep and high levels of training/non-training related stress the immune system is compromised and the athlete gets sick. At what point do we intervene? Intervention starts with a conversation. The conversation acknowledges a red flag and helps determine what means of action to take (if any at all). In this situation, the first uncharacteristically low sleep rating should’ve started the conversation. 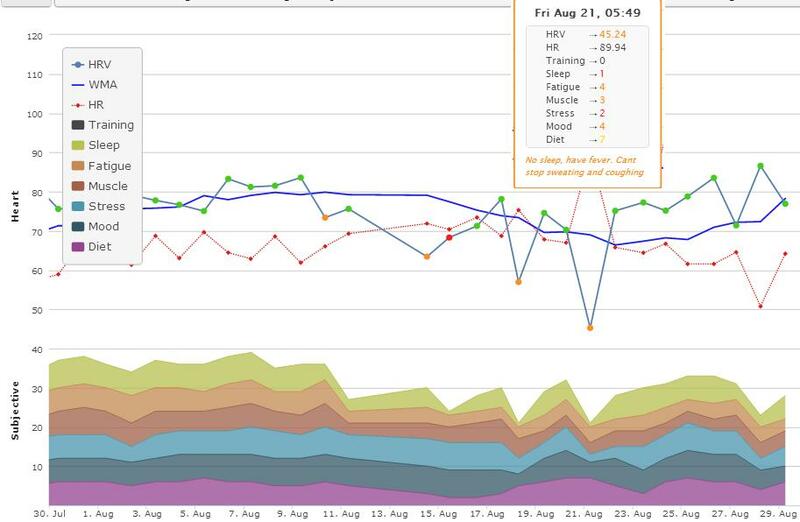 This entry was posted in Heart Rate Variability, Monitoring and tagged analysis, athlete monitoring, data. Bookmark the permalink. 4 Responses to When do we intervene? WMA = weekly moving average or 7-day rolling average for HRV. I am curious as to what software is being used here? This is the ithlete Team software.